Dream Pod 9: Jovian Wars Venus Forces Kickstarter Launching Today, Monday Nov. 5th 2018, at 7:30 pm EST! The Kickstarters initial funding goal is $4,000 CAD (about $3,100 USD), needed to cover the mold costs for the 8 new Venus ships and give our Backers some great reward packages. After we've reached that goal we'll be announcing stretch goals to added extra weapons and parts to the ships. Checkout the graphics below for our great reward levels, with Captain reward level including a Jovian Wars Patch and the first 4 ships and the Commodore reward level including Patch and all 8 ships. We also have additional reward levels that add all 9 of the Venus Exo-Armor and Fighter/Bomber squads to the Captain and Commodore packages. Plus our Pilot reward level with Patch and you select which ships and other Add-Ons for an extra pledge that you want for a reward package. 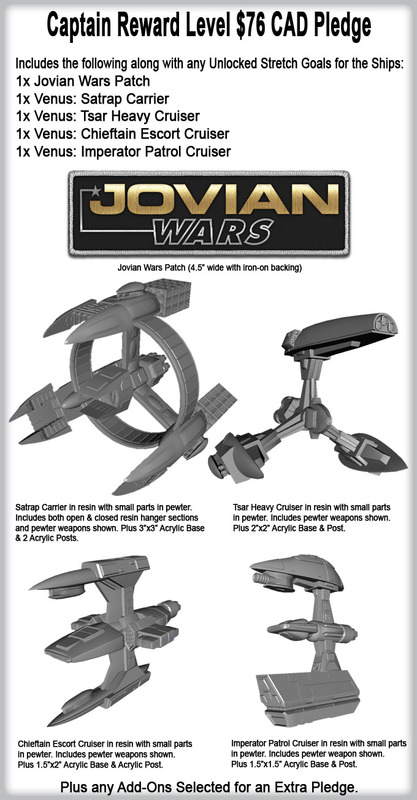 You can preview the Jovian Wars Venus Forces Kickstarter via the following preview link. We'll make another post this evening once the Kickstarter is live with the official link. Home › Blogs › Robert Dubois's blog › Jovian Wars Venus Forces Kickstarter Launching Today, Monday Nov. 5th 2018, at 7:30 pm EST!